Before setting out to make a fine art print, I make 8X10 full frame proofs of every candidate negative. I do this as soon as practical after every shooting session (a week in the backcountry?). By developing film and making proofs soon thereafter, I never fall behind in the workflow of expressive visualization of a prospect image. Making a proof is the first stage to arriving at a work print. It is from the work print that the decision will be made to invest in a fine print - and ultimately an edition. I have many file boxes full of numbered folders of proofs, only a tiny percentage of which ever pass muster to attain the rank of fine print. It is my preference to use graded papers. I have experienced no better result from the use of variable contrast (VC) papers and the "split printing" method. When I must use VC papers, as in the production of some murals (using large rolls), I simply use the same procedures as for graded paper after first determining proper light filtration/mixing to determine suitable contrast. Obtaining a useful proof requires only that a test print be made first to determine the appropriate exposure for a straight print, followed by quick, approximate dodges (if, necessary) and burns (almost always necessary). Being familiar with speeds of the various contrast grades of the papers I work with means only one test print is usually necessary. I can "ball park" the other grades to approximate a straight print from which I can obtain a useful proof. I normally end up with 3 proofs for every negative, as I need to see all contrast grades (grade 2 - grade 4) to properly evaluate its potential. I can usually knock off between 5 and 10 proof sets per negative in a couple of hours, depending upon the difficulty and range of exposures of the negatives. 5 - 10 prospect proofs is quite a treasure for only a week in the Sierra! Finally, I always use full sheets for every size of sheet paper, even when determining initial exposures. I need to see a range of test exposures over the entire image area to make a proper proof quickly and economically. It's my belief that exposure information for the whole print is actually less wasteful than the otherwise conservative method of using half or partial sheets in "important", or key regions. This is particularly advantageous for landscapes with a lot of sky since I can get a fairly good idea of just how much burning (almost always) will be required to bring out proper sky color and cloud definition. A thoughtfully exposed test print can save many full sheets from wastage in the work print stages of of creating a fine print. 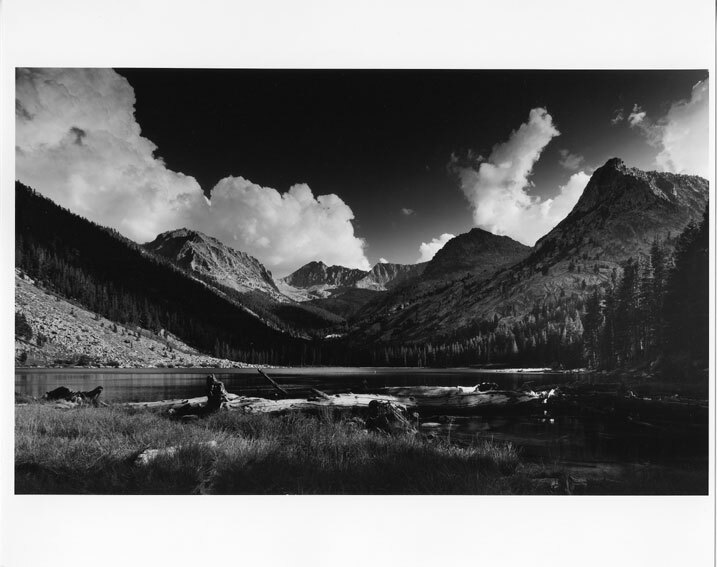 The first step in making a useful proof is to make a test print by exposing successive sections of the print under the enlarger with an opaque burn card large enough to to cover the print completely, at a uniform time interval. 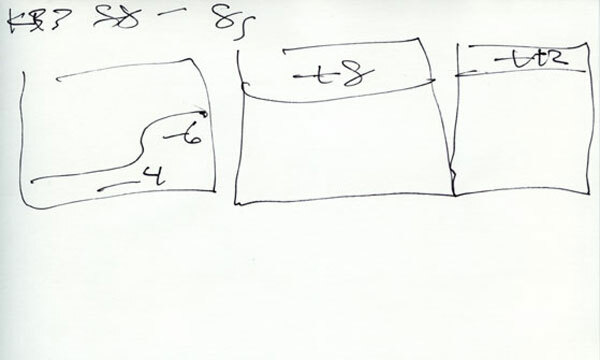 In EXAMPLE 1 the card is moved from left to right, the leftmost strip having been exposed for the longest amount of time (24 seconds) and the the rightmost the shortest (4 seconds). I could just as easily have gone right to left, up to down - you get the idea. Just choose a direction which will reveal the most information for the negative at hand. Occasionally, I make two test prints at once, each on a separate grade of paper with opposing directions so that I can consolidate processing. Immediately, a couple things are apparent. This is a very "thin" negative, especially along the bottom and right side. Thin is slang for the lack of density, or silver deposits, on the negative. 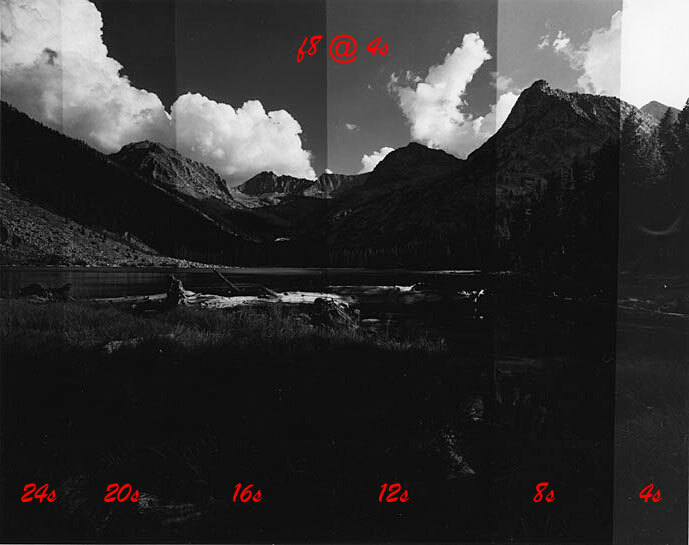 This means that the negative is underexposed. The reason in this case is that the light in the scene exceeded the latitude of the film's ability to capture it. This might have been avoided by restricting the the scene to only elements of the right side, deep in shadow, and giving more (proper) exposure to the film. But this wasn't the point of the scene (i.e., my previsualization). So, to take in the whole scene as intended with available lenses (in this case a choice of but two fixed focal length lenses, carried 20 miles and 6,000 vertical feet into the wilderness - with camping gear! ), a decision was made to expose for the lake, background mountains, and sky - sacrificing "correct" exposure on the right side. Great, thinks I - I'll just deal with it in the darkroom. The other issue is the "half moon", again in the forest on the right. This is always a deal breaker in committing to a fine print, as it will always print through. Half moon negative damage such as this is almost always the fault of a clumsy lab worker during film development - errh, me. But I'm not taking the rap for this one. Read what I have to say about Eastern European films. EXAMPLE 2 is a combined series of quick and dirty dodges and burns, accomplished on one piece of paper with a constantly moving burn card. As judged from the test print, I began with 8 seconds of initial exposure for the entire print (i.e., the second test strip from the right in EXAMPLE 1). See Making A Fine Art Print for more about how I select a useful test strip. I dodged (withheld exposure) the deeply shadowed forest on the right and grass in the foreground during this general exposure. The horizon peaks and sky were then burned (added exposure), followed by burning the sky alone. Approximately 10% of the image is underexposed. 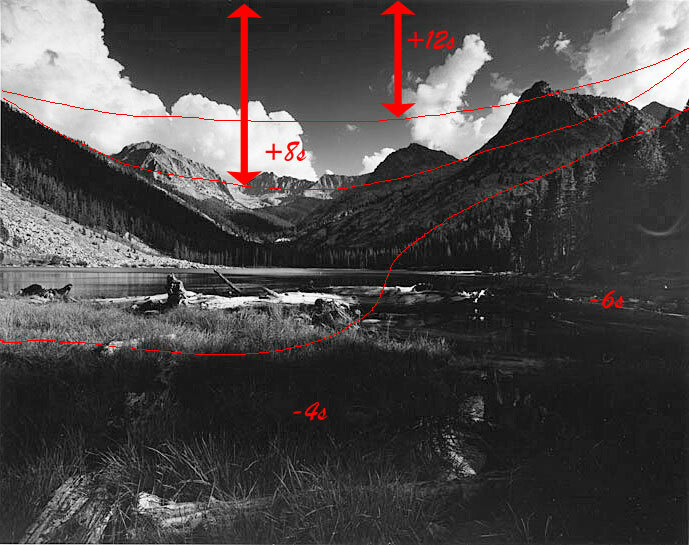 The right side forest and lake outlet will be difficult to print with any coherence. The entire bottom quarter of the image is an unpleasant, muddy dark gray despite the presence of direct sun light on the foremost rotting log. It didn't look this way to me when I took the picture and so does not fulfill my previsualization of the scene. That pesky half moon emulsion damage probably isn't going away. Printing notes scribbled on the back side of the proof print before processing - in the dark. Allow me to interpret: Kentmere Bromide Grade 3 paper, enlarger lens aperture @ f8 for 8 seconds initial exposure, dodge forest in deep shadow for 6 seconds and foreground grass for 4 seconds with an s-shaped bent card, burn peaks and sky for 8 seconds, and finally burn sky for 12 seconds. In the course of the past few years I have become increasingly enamored of the oblong-ish "widescreen" format (aspect ratio of 3 to 5) for certain images. Ahaa! 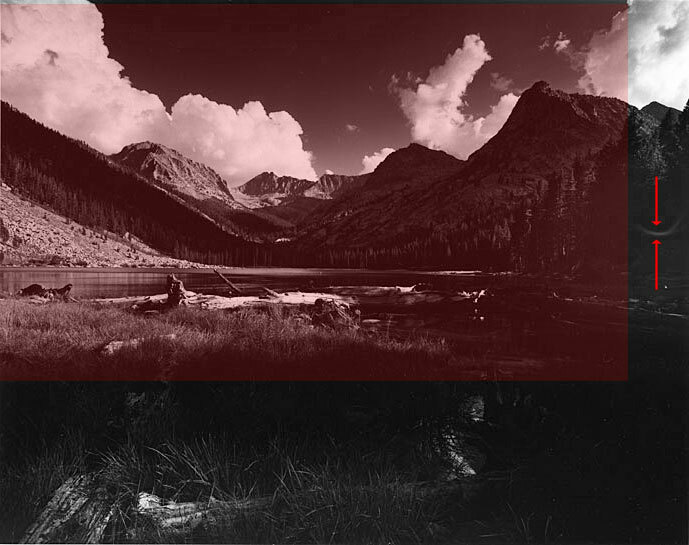 By cropping the original 4:5 proof to 3:5, I avoid all of the obvious, insolvable printing problems and achieve a proof which really does begin to communicate the evanescent expansiveness of the scene as I experienced it - my previsualization. Cropping the full frame proof to the widescreen (3:5) format and repeating the printing sequence in EXAMPLE 2 (adjusting times for what is in effect now a larger print) has given me both a workable proof and a much stronger overall composition.